Hidden on the outskirts of Weaverville, Barbara Cook’s home is not your typical dwelling. During the approach up the gravel driveway, the first impression is stunning—almost startling. Is it a pagoda? A temple? Outside, the home is adorned with intricately carved molding, lintels, and columns that create the look of a Buddhist monastery. Inside, copper prayer wheels, wall-to-wall Buddhist Paubha paintings, religious statues in gold-plated copper and bronze, wall hangings, and hand-carved doors enhance the place’s spirit. A professional metalsmith and award-winning jewelry designer, Cook has devoted years to helping the people of Nepal. The country has been such an integral part of her life she can’t help but bring pieces of it home with her. “It’s a magical place on Earth in spite of all the political unrest and lack of governance,” Cook says of the country that ended a decade-long civil war only six years ago. Since her first visit to Nepal more than 20 years ago, when she graduated from tourist to humanitarian, she’s worked with Educate the Children (ETC) to improve lives in rural Nepalese communities, and with Global Family Village to create alternatives to traditional orphanages. Today, she strives to preserve and cultivate the skilled talents of Nepali master artists. Five months of the year she lives in Kathmandu, designing and creating jewelry and working on program development for the Nepal Traditional Handicraft Training Center. Then, she’s stateside, setting up gallery shows for collections of traditional Nepalese art. 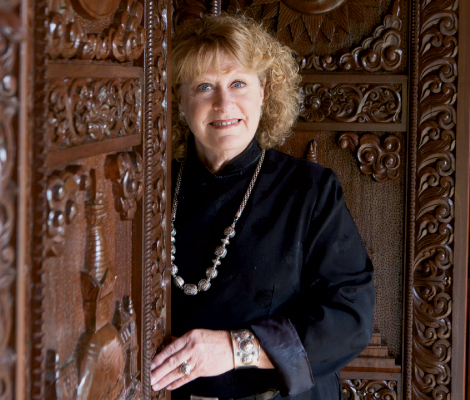 She also invites home builders and interior decorators to her house to see the pieces imported for sale through Himalayan Stone and Wood Carving, a company she created with artisans on the other side of the world. Cook’s path to this calling was a circuitous one. In 1989, she set off on an extended trip through Asia and the Middle East, leaving her job as director of international conferences at the University of Miami. She took six months to backpack through China, Thailand, Malaysia, Indonesia, Nepal, and India. But her jaunt came to a halt before she reached the Middle East. “The first war in Iraq broke out, and U.S. citizens weren’t supposed to travel there,” she explains. With her already loose itinerary in shambles, Cook returned to India where she felt comfortable, and made her way around the country, meeting other travelers and staying in villages or with families that welcomed her. One of the people she met was a doctor who asked for her help. He was rebuilding a dispensary at Mother Teresa’s leprosy center, and all the medications were labeled in German, which she could read and speak. “It felt somewhat serendipitous and that it was where I was supposed to be,” she says. Cook soon found that being a tourist wasn’t nearly as fulfilling as being involved. After six months, she returned to Nepal in hopes of bettering lives there. “My first work was with Educate the Children, a group that connects children with sponsors,” she says. Two years in, the organization broadened its focus to aid the entire community. Cook became involved with issues of education, agriculture, and empowering women with financial independence via micro-credit business loans. With the dedicated work of Nepali administrators and foreign volunteers, ETC has developed into one of the country’s most respected nongovernmental organizations (NGO). Drawing on her background with ETC, Cook linked up with Global Family Village in 2004. The forward-thinking organization assists communities to transform traditional institutionalized orphanages into places where children live in groups with surrogate mothers, creating an atmosphere that more closely resembles family life. As Cook watched life slowly improve for the people she served, the artist in her couldn’t ignore the decline of indigenous crafts. Fewer and fewer young people wanted to take the time to learn the skills necessary to master the traditional art forms, and the masters were growing older. In 2006, working alongside Nepal’s top artists, Cook assisted in the revival of the Nepal Traditional Handicraft Training Center, a working collective of artists, instructors, and students. Eventually, she would like to see that collective, which is based in Kathmandu’s Lalitpur district, develop into a permanent facility “where artists can live in a cooperative, compile a resource library, share their knowledge, and build community resources.” But to achieve that level of success, she knows the world needs to better understand Nepali art. For centuries, these artists weren’t recognized, rather referred to as laborers for the palaces and temples, creating lost-wax casts, repoussé, inlaid filigree, gold-gilded and painted-copper religious sculptures, and wood and stone carvings. They never signed their work. “And the dealers and middlemen who buy their pieces now don’t want them to sign it either,” says Cook. “They don’t want to risk the development of direct client-artist relationships. “Normally, after these pieces have been imported, been through dealers and galleries, and sold to buyers, they’ve been marked up far beyond what the artist in Nepal gets paid,” she says. The buyer pays thousands of dollars, but the artist, who may have spent months working on a single piece, sees only hundreds. Her goal is to put buyers in closer contact with the artists, hopefully bringing a bigger share of the wealth back to Nepal. That’s why she began organizing Nepalese exhibits in the United States, and brings the artists to the openings of their shows whenever possible. Last year, many came to an exhibit she organized at Kennesaw State University in Atlanta, one of the gallery’s most highly attended events. This year, she’s hosting an exhibit in Berkeley, California, with Asian art scholar Siddhartha Shah. The show pairs contemporary works and traditional Newari Paubha paintings for the first time. And with each show, the international art scene gains a greater understanding of the traditional Nepali style, while developing a familiarity with artists such as Bhim Shakya, Lok Chitrakar, Rusam Amatya, Deepak Joshi, and Rajesh Shakya. And even though she also travels selling her jewelry on the weekend art show circuit in the U.S., she doesn’t see her trips to Nepal ending. “The people are so kind and gentle, and so giving with often so little to offer,” she says. But in truth, they’ve given her plenty—a destination for her life’s journey.